The other day we walked past a fruit stand and I noticed something that I had never seen before, something strange and wonderful. I picked it up and the fruit vendor explained, "That's fruta-pão." 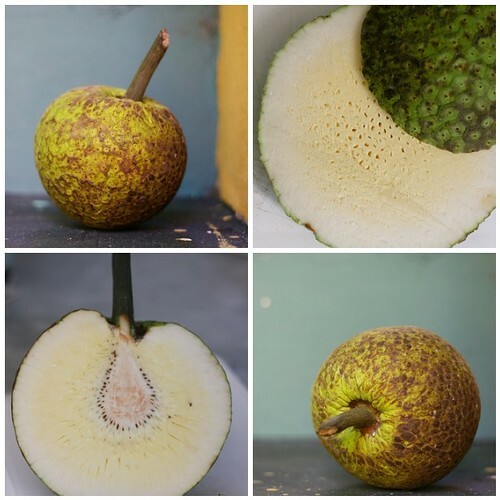 Literally, breadfruit. He said it's like bread inside. Fruit that's like bread inside? Who ever heard of such a thing? Ken says it looks like a pumpkin and a lizard had a baby. We sliced it like bread (obviously!) and it really does look and feel like bread inside. It's very spongy and feels starchy, and it isn't sweet but it also isn't bitter. It tastes a little bit like a turnip, and we both thought it needed some accessories to make it a little more delicious. We looked up how it's eaten and discovered that it's usually cooked up with something sweet; roasted or baked with butter and sugar and coconut milk. 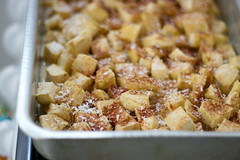 So I cubed it and poured coconut milk over the top, then added a bit of butter and sugar and sprinkled the top with cinnamon and coconut to make a sort of breadfruit pudding. The texture still isn't quite what I was hoping for, though. Sliced breadfruit definitely isn't the greatest thing since sliced bread. Update! I finally remembered what fruta-pão reminds me of: yuca. The kind I've had as "fries" in Peruvian restaurants. Fruta-pão has that same denseness and starchy texture. If I ever happen upon one again maybe I'll try roasting it as a savoury side. Or maybe I'll just try to trade it for a mango. We really enjoyed roasted breadfruit! It was a very nice combo to have with jerk pork and chicken in Jamaica. It was not very flavorful, but a welcome accompaniment to the rich meat.